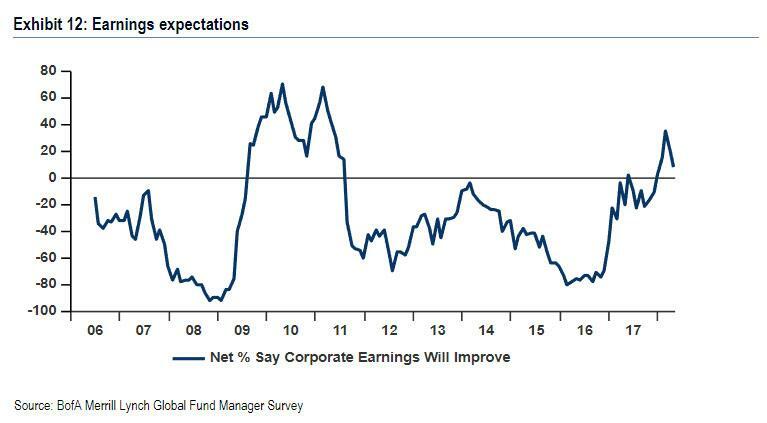 One month ago, Morgan Stanley ominously predicted that the market hit its 2018 - and perhaps cycle - highs in the late January melt up. 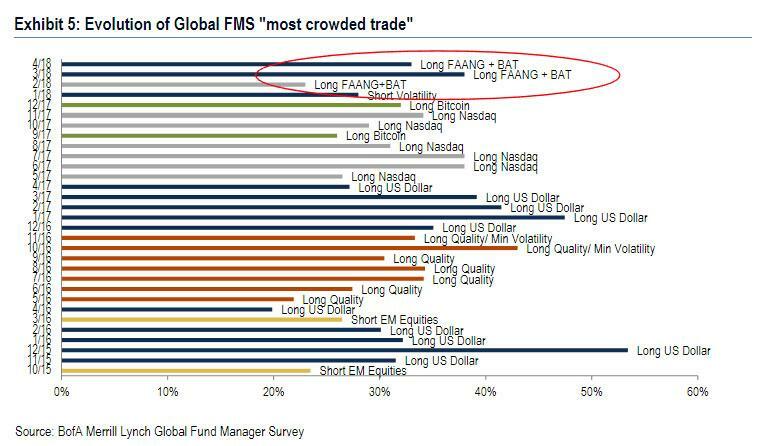 And, according to roughly 18% of respondents in the latest, April, Global Fund Manager Survey conducted by Bank of America, (in which 176 participants with $543bn AUM responded to the Global FMS questions), that's exactly what will happen. 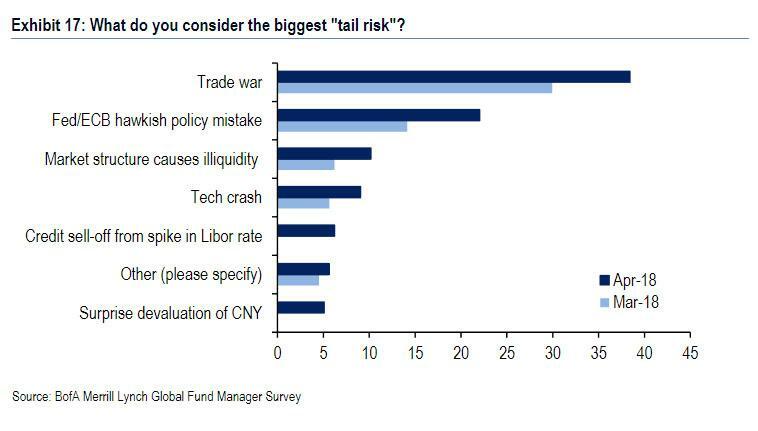 However, according to no less than 40% of global financial "smart money", the market peak won't hit until the second half of 2018, and while 39% of respondents answered that the market won't peak until 2019, what is notable, is that nearly two thirds of respondents believe that the central-bank inspired and funded bull market, which started in March 2009, will end shortly before its 10 year anniversary. 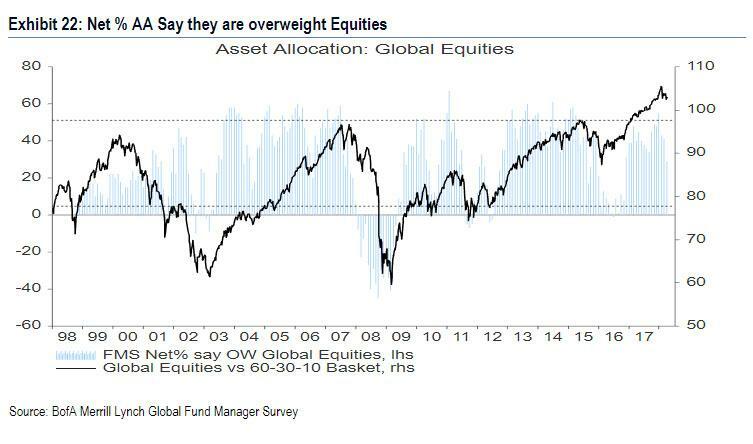 As a result of this growing skepticism that the market peak is just around the corner, the survey respondents' allocation to equities fell to an 18-month low of just 29% (net), down from net 41% overweight in March. 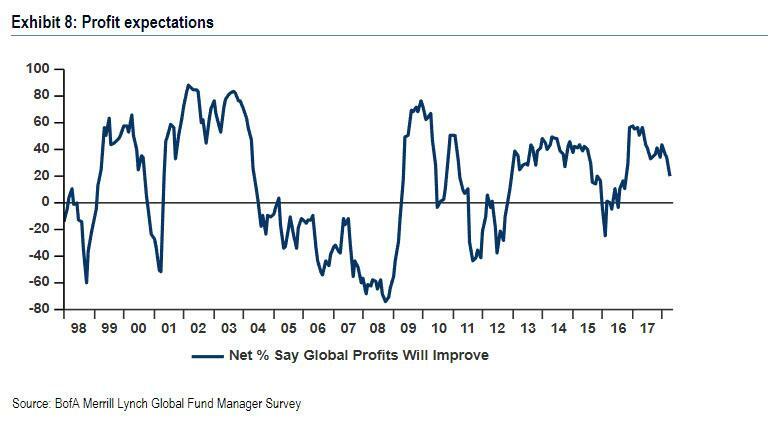 ... while only 20% net expect profit expectations to improve over the next 12 months, an 18-month lows. 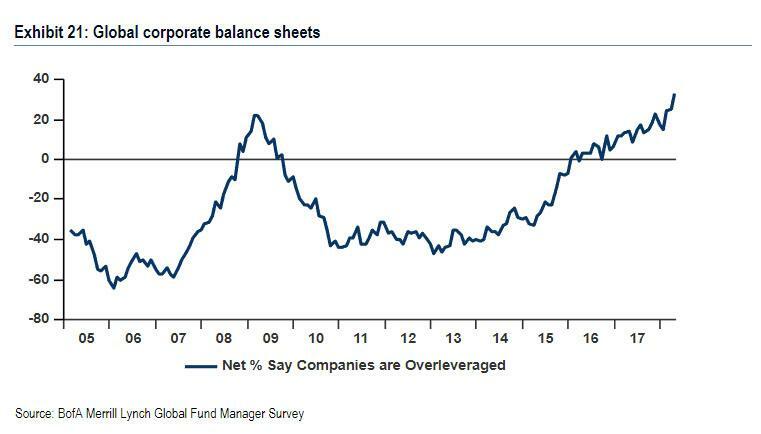 Meanwhile, in an indication of how old this cycle has grown, the net percentage of investors who would like to see corporates improve their balance sheets remains at 8-year highs; a record net 33% think corporate balance sheets are overleveraged. 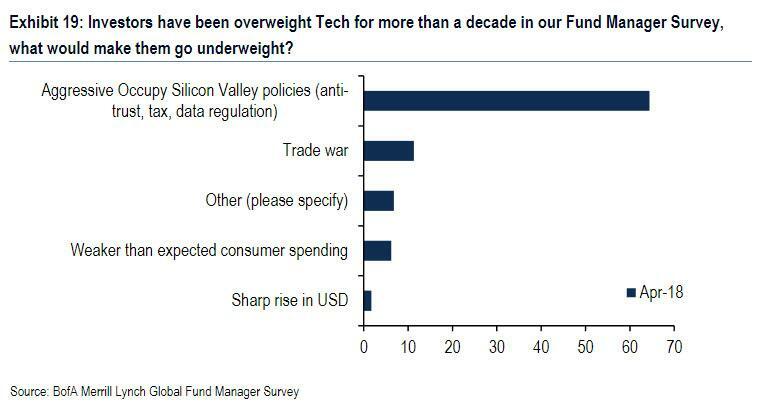 At the same time, when looking at specific sectors, survey respondents note that while they have been overweight Tech for more than a decade of FMS history, 64% of fund managers asked would move to underweight Tech if anti-trust, tax and privacy regulations ratcheted up. In other words, it's up to Trump and the government whether to pop the world's biggest asset bubble. 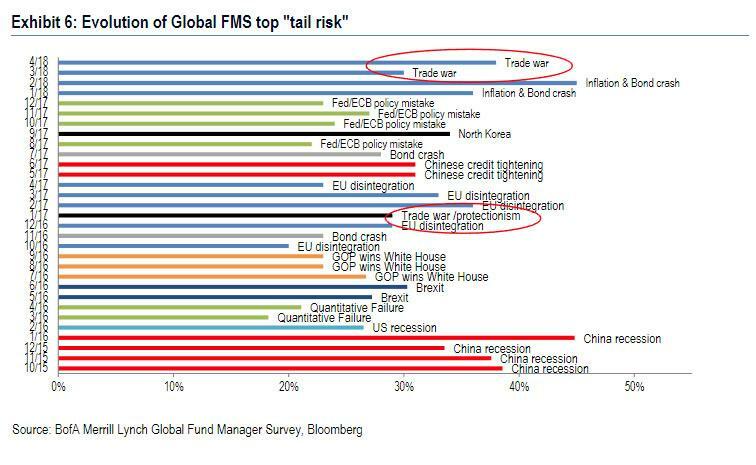 ... followed by a hawkish policy mistake by the Fed/ECB (22%) and concerns that the market structure will cause illiquidity (10%). 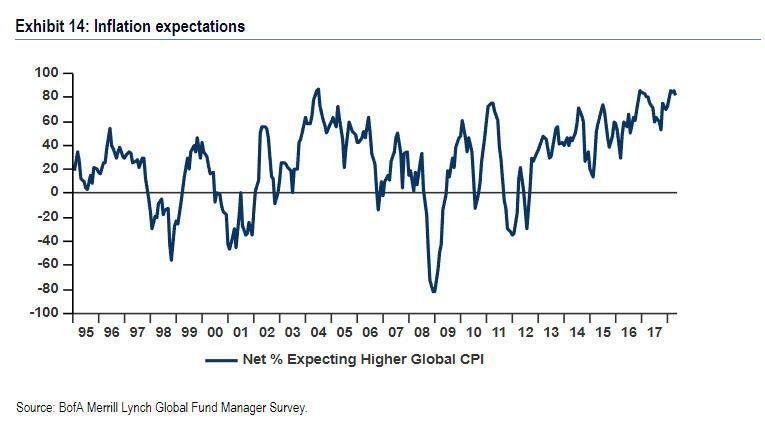 Another place where there is a lot of agreement, is that higher inflation is coming, and remains the consensus view, with net 82% of investors surveyed expecting core CPI to rise over the next 12 months. 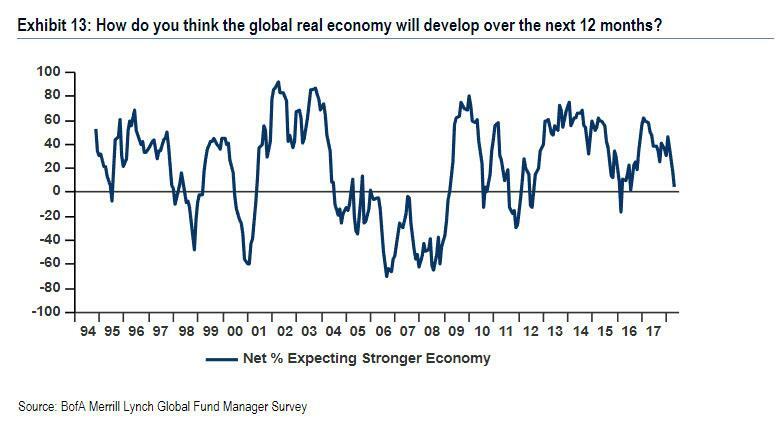 Translation: yields are about to plunge as the biggest consensus trade of all blows up in the market's face, which may also explain why there has never been such a gaping divergence between investor sentiment and the bond market, where the curve flattening despite assessment of loose fiscal policy at an all-time high. 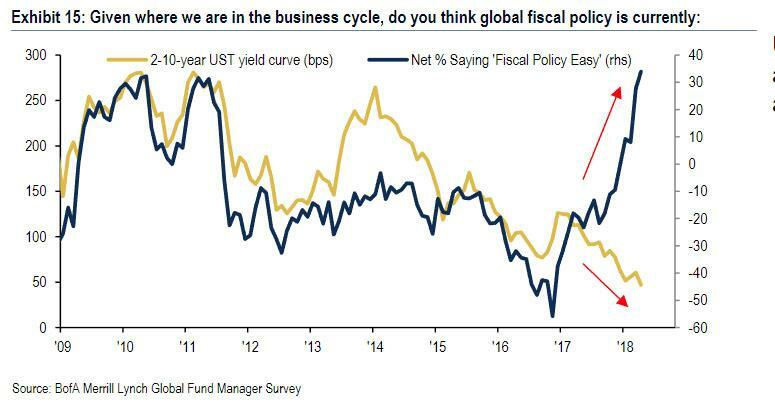 Meanwhile, another ominous development has emerged: investors are lowering the "magic number" in 10Y yield terms that would cause investors to rotate from equities back into bonds, from 3.6% in March to 3.5% in April. 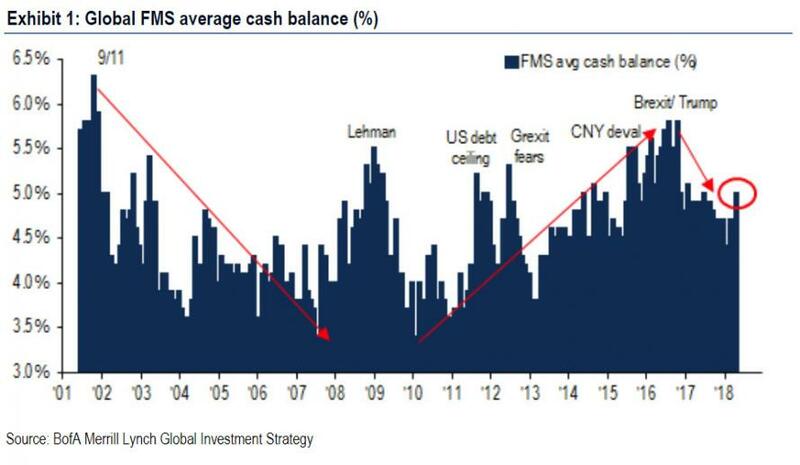 Putting it all together, here is BofA CIO Michael Hartnett, who said that "the bulls have been silenced but not defeated, evidenced by increased cash allocations and low expectations of global growth and profits. 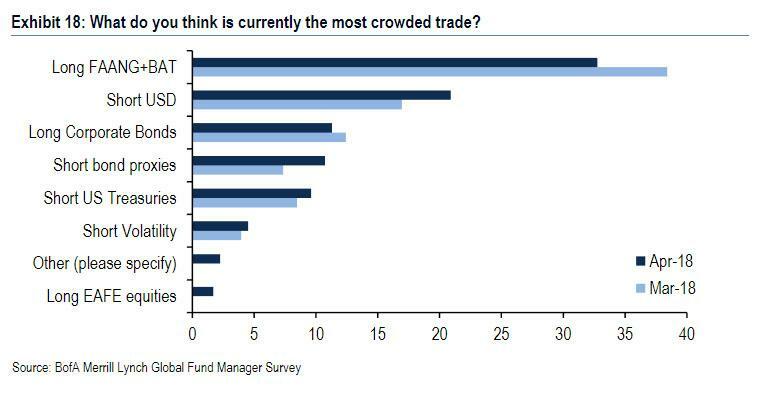 But true bull capitulation is absent, with most investors saying the peak in the stock market is still to come."